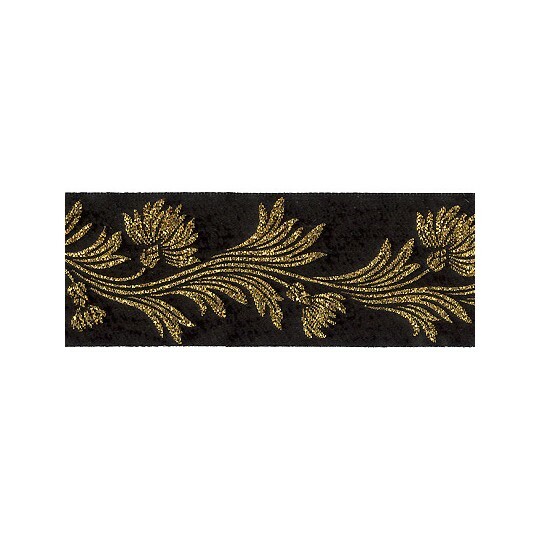 This fancy woven jacquard trim features a pretty geometric flower design in metallic gold and two shades of pink on a black background. 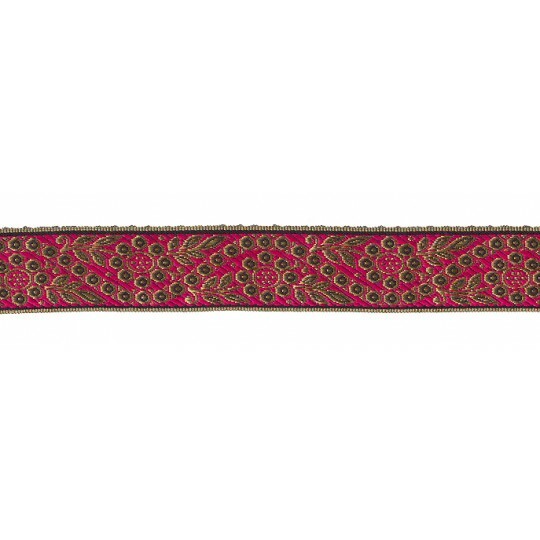 Measures 1" wide and is made in India. Sold by the yard, please enter the number of yards desired below. 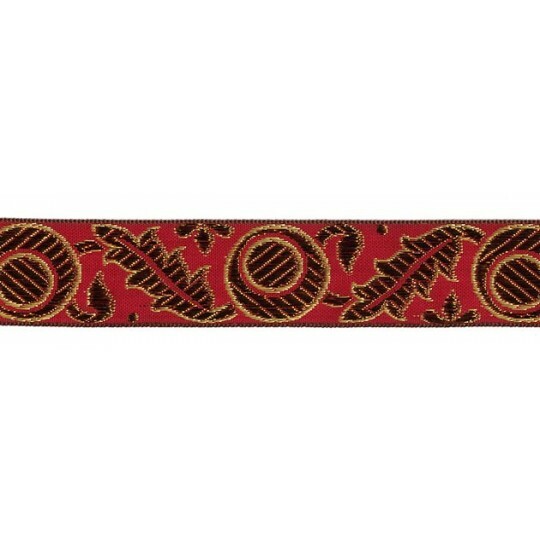 This fancy woven jacquard trim features a pretty geometric flower design in metallic gold, red and pink on a black background. Measures 1" wide and is made in India. Sold by the yard, please enter the number of yards desired below. 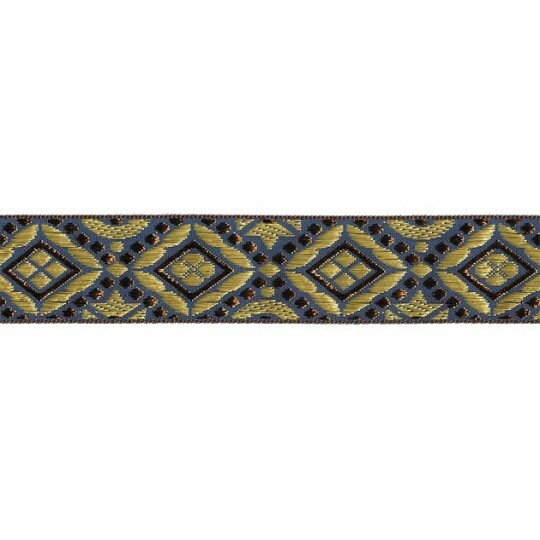 This fancy woven jacquard trim features a pretty geometric flower design in metallic gold and two shades of blue on a black background. 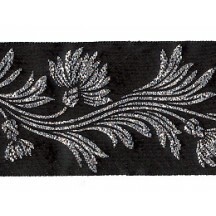 Measures 1" wide and is made in India. Sold by the yard, please enter the number of yards desired below. 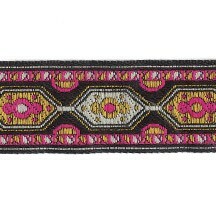 This woven trim features a geometric pattern in pink and golden yellow on a black background. 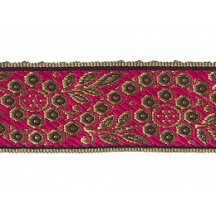 Measures 1" wide and is made in India. Sold by the yard, please enter the number of yards desired below. 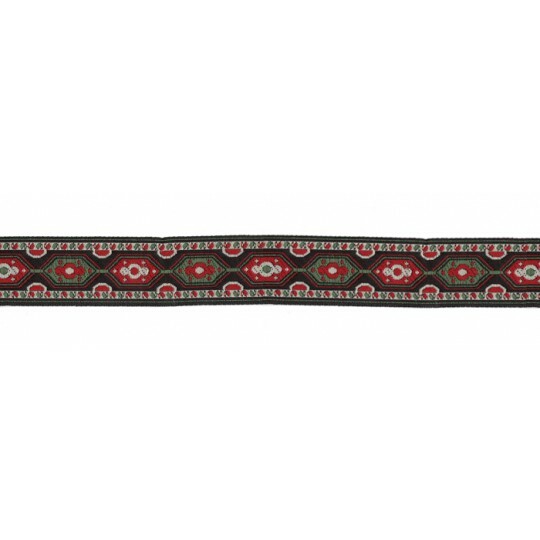 This woven trim features a geometric pattern in red and green on a black background. Measures 1" wide and is made in India. Sold by the yard, please enter the number of yards desired below. 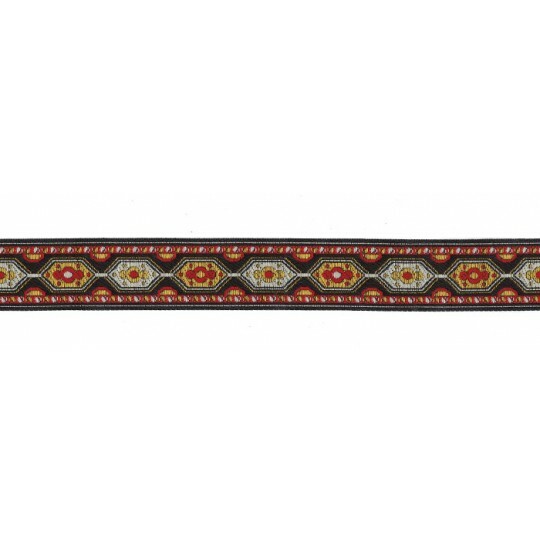 This woven trim features a geometric pattern in red and golden yellow on a black background. 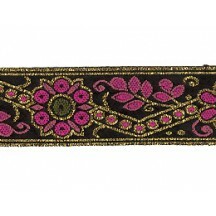 Measures 1" wide and is made in India. Sold by the yard, please enter the number of yards desired below. 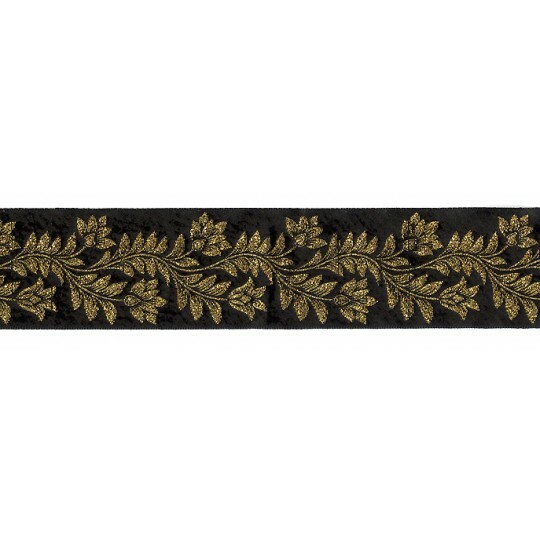 This fancy woven jacquard trim features a pretty geometric dot flower design in metallic gold and black. 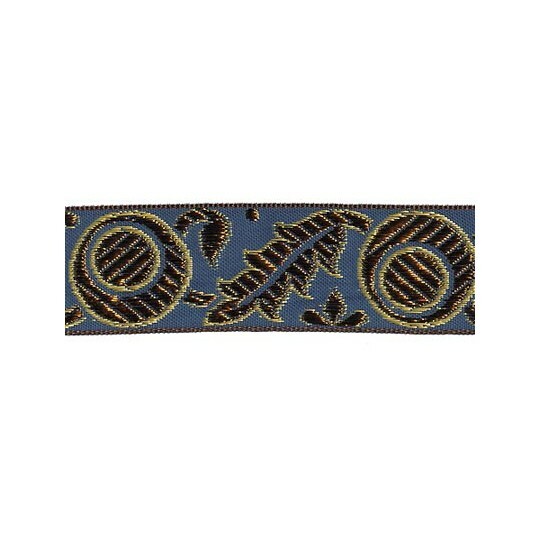 Measures 1-3/8" wide and is made in India. The reverse side is also quite beautiful. Sold by the yard, please enter the number of yards desired below. 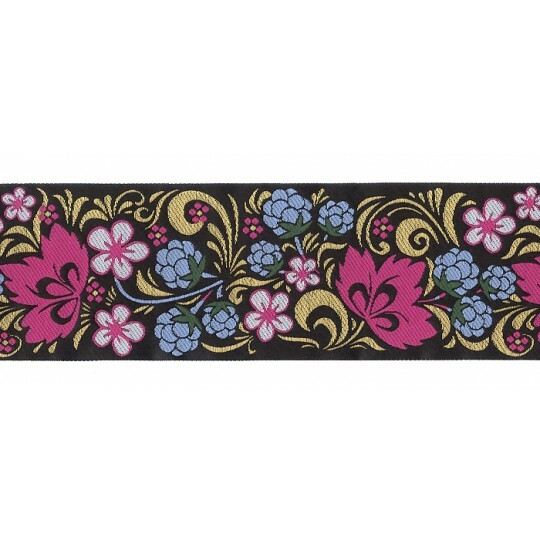 This fancy woven jacquard trim features a pretty geometric dot flower design in metallic gold and hot pink with black accents. 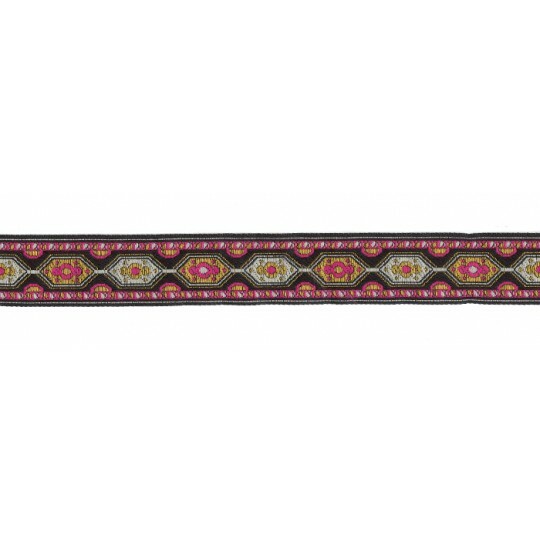 Measures 1-3/8" wide and is made in India. The reverse side is also quite beautiful. Sold by the yard, please enter the number of yards desired below. 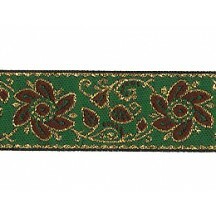 This fancy woven jacquard trim features a pretty flower design in metallic gold, green and brown. 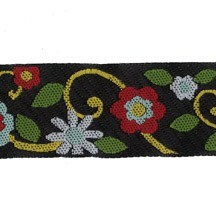 Measures 7/8" wide and is made in India. Sold by the yard, please enter the number of yards desired below. 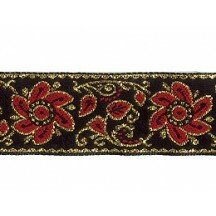 This fancy woven jacquard trim features a pretty flower design in metallic gold, black and brick red. 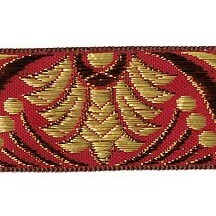 Measures 7/8" wide and is made in India. Sold by the yard, please enter the number of yards desired below. 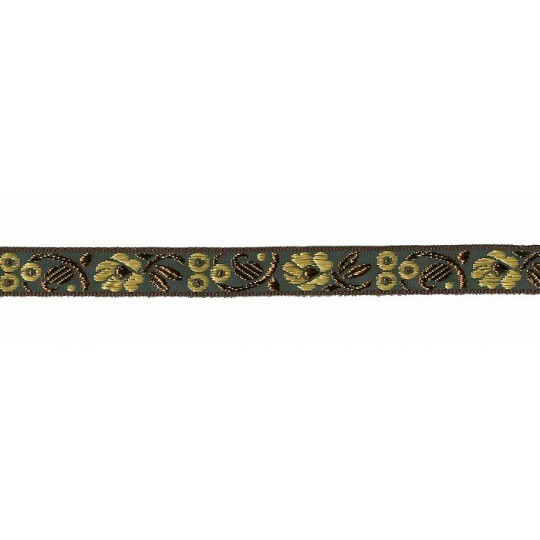 This fancy woven jacquard trim features a stylized floral pattern in bronze and gold metallic on a green background. 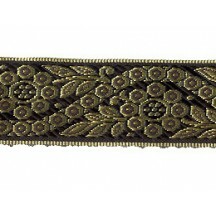 Measures 5/8" wide and is made in India. Sold by the yard, please enter the number of yards desired below. 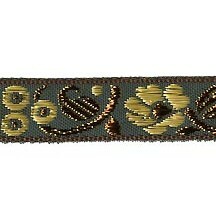 This fancy woven jacquard trim features a floral lotus pattern in bronze and gold metallic on a green background. 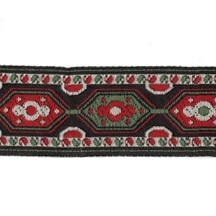 Measures 1-1/4" wide and is made in India. Sold by the yard, please enter the number of yards desired below. 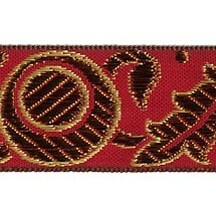 This fancy woven jacquard trim features a floral lotus pattern in bronze and gold metallic on a tomato red background. 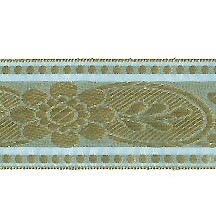 Measures 1-1/4" wide and is made in India. Sold by the yard, please enter the number of yards desired below. 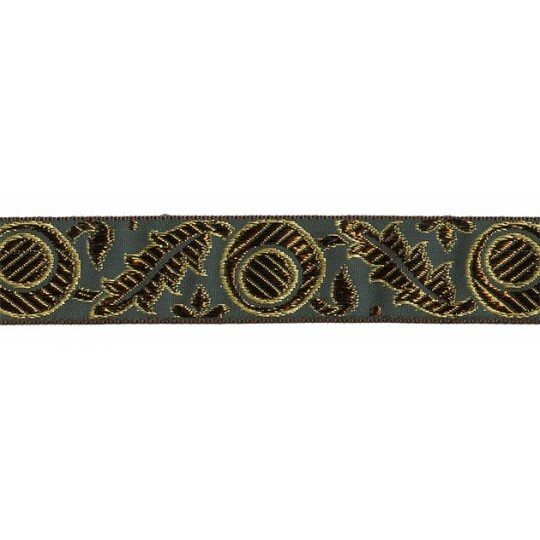 This fancy woven jacquard trim features a stylized autumn leaf and circle pattern in bronze and gold metallic on a blue background. 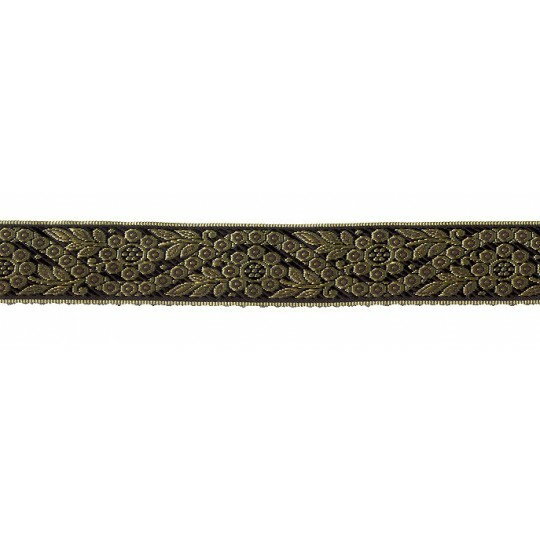 Measures 1-1/4" wide and is made in India. Sold by the yard, please enter the number of yards desired below. 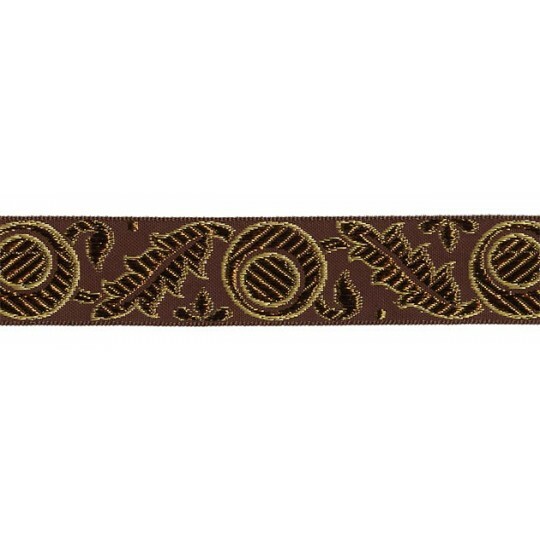 This fancy woven jacquard trim features a stylized autumn leaf and circle pattern in bronze and gold metallic on a dark brown background. 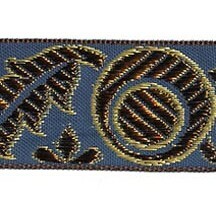 Measures 1-1/4" wide and is made in India. Sold by the yard, please enter the number of yards desired below. This fancy woven jacquard trim features a stylized autumn leaf and circle pattern in bronze and gold metallic on a green background. 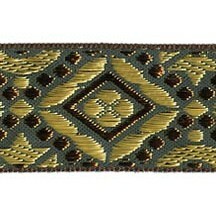 Measures 1-1/4" wide and is made in India. Sold by the yard, please enter the number of yards desired below. This fancy woven jacquard trim features a stylized autumn leaf and circle pattern in bronze and gold metallic on a tomato red background. 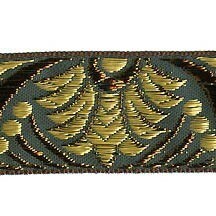 Measures 1-1/4" wide and is made in India. Sold by the yard, please enter the number of yards desired below. 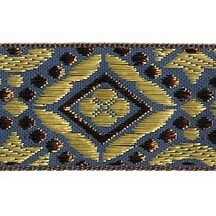 This fancy woven jacquard trim features a geometric pattern in bronze and gold metallic on a blue background. 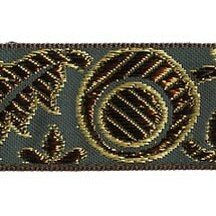 Measures 1-1/4" wide and is made in India. Sold by the yard, please enter the number of yards desired below. This fancy woven jacquard trim features a geometric pattern in bronze and gold metallic on a fuchsia background. 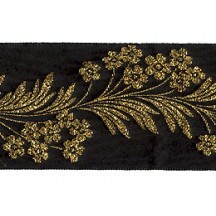 Measures 1-1/4" wide and is made in India. Sold by the yard, please enter the number of yards desired below. 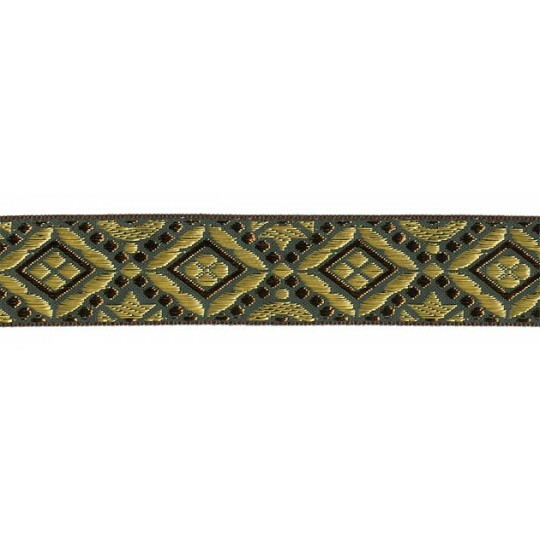 This fancy woven jacquard trim features a geometric pattern in bronze and gold metallic on a green background. 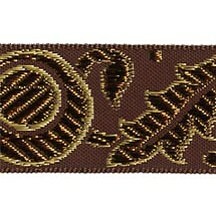 Measures 1-1/4" wide and is made in India. Sold by the yard, please enter the number of yards desired below. 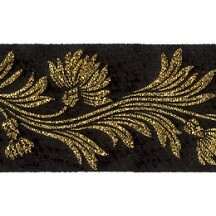 This fancy woven jacquard trim features a pretty dianthus flower design in metallic gold on a black background. 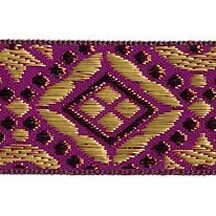 Measures 1-5/8" wide and is made in India. The reverse side is also quite beautiful. Sold by the yard, please enter the number of yards desired below. 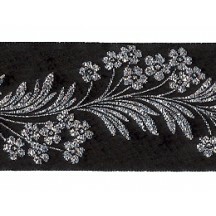 This fancy woven jacquard trim features a pretty dianthus flower design in metallic silver on a black background. 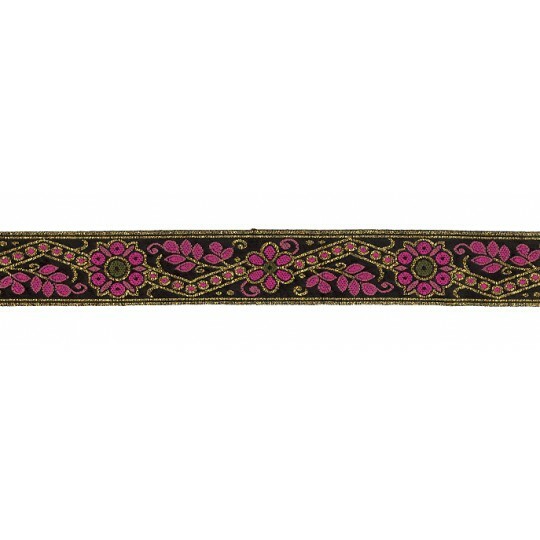 Measures 1-5/8" wide and is made in India. The reverse side is also quite beautiful. Sold by the yard, please enter the number of yards desired below. 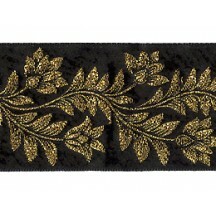 This fancy woven jacquard trim features a pretty forget me not flower design in metallic gold on a black background. 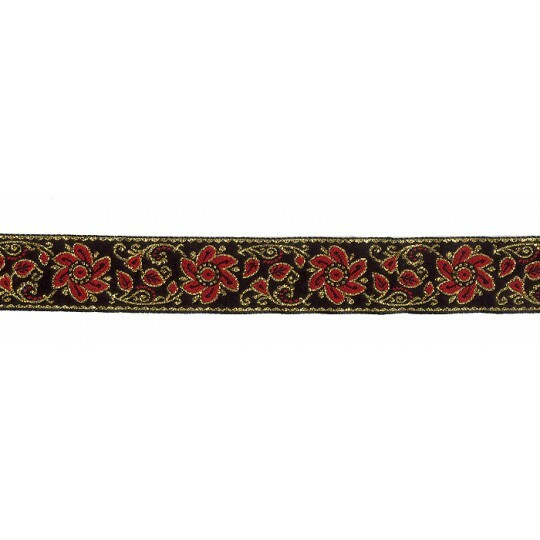 Measures 1-5/8" wide and is made in India. The reverse side is also quite beautiful. Sold by the yard, please enter the number of yards desired below. 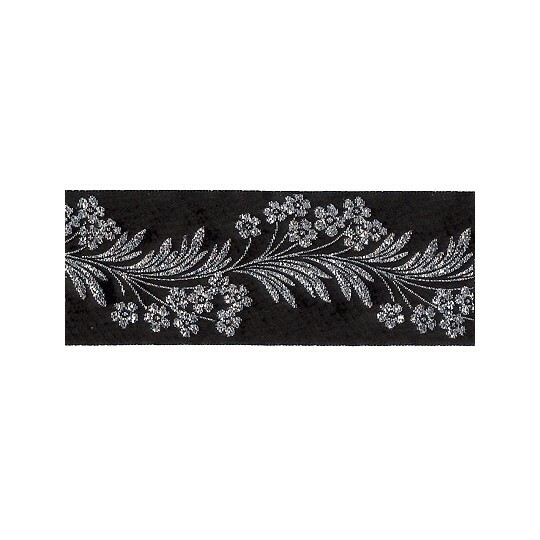 This fancy woven jacquard trim features a pretty forget me not flower design in metallic silver on a black background. 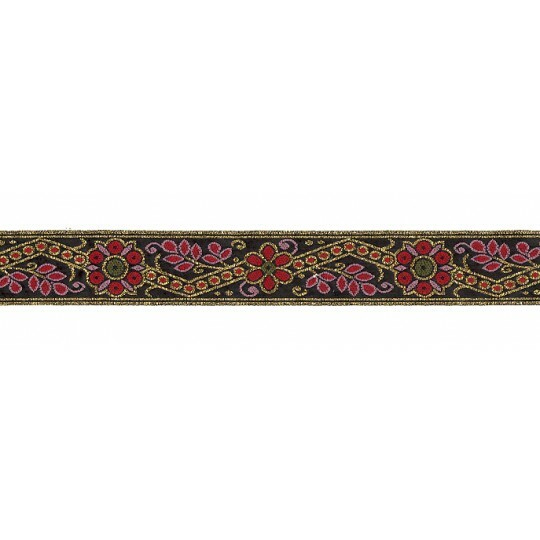 Measures 1-5/8" wide and is made in India. The reverse side is also quite beautiful. Sold by the yard, please enter the number of yards desired below. 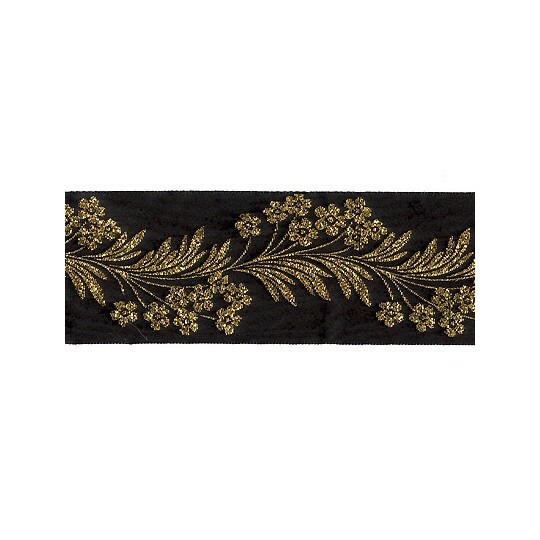 This fancy woven jacquard trim features a pretty flower and leaf design in metallic gold on a black background. 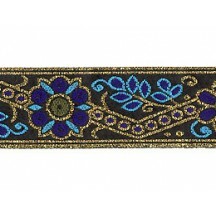 Measures 1-5/8" wide and is made in India. The reverse side is also quite beautiful. Sold by the yard, please enter the number of yards desired below. This fancy woven jacquard trim features a pretty flower and leaf design in metallic silver on a black background. 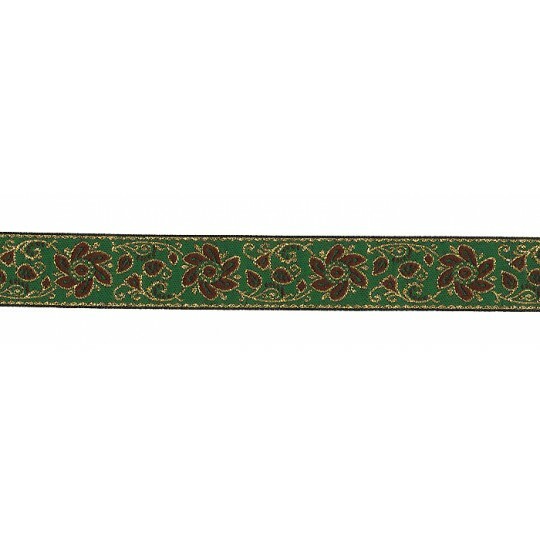 Measures 1-5/8" wide and is made in India. The reverse side is also quite beautiful. Sold by the yard, please enter the number of yards desired below. 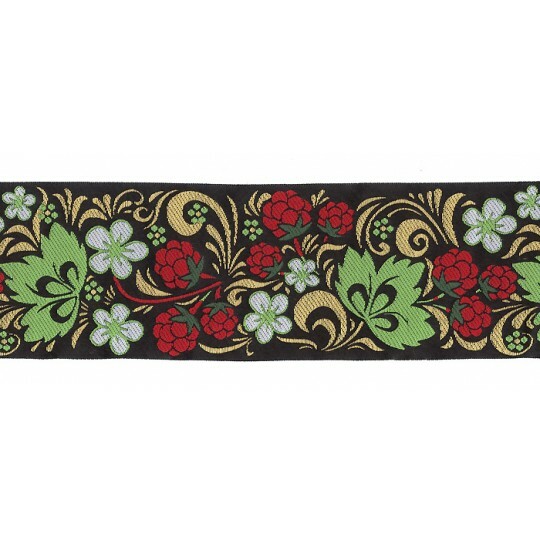 This woven trim features a floral pattern in mint and dark red on a black background. 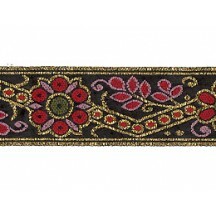 Measures 1" wide and is made in India. Sold by the yard, please enter the number of yards desired below. 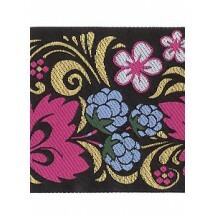 This woven trim features a berry and leaf pattern in blue and pink on a black background. 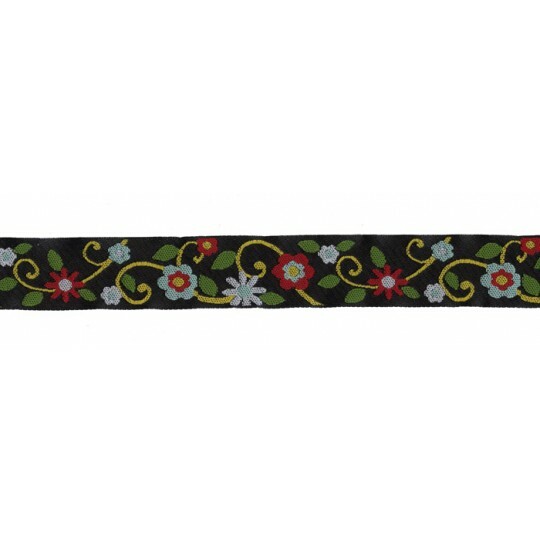 Measures 2-5/8" wide and is made in India. Sold by the yard, please enter the number of yards desired below. 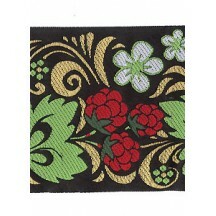 This woven trim features a berry and leaf pattern in red and green on a black background. 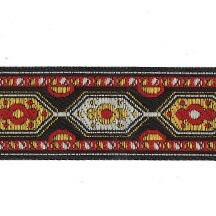 Measures 2-5/8" wide and is made in India. Sold by the yard, please enter the number of yards desired below. 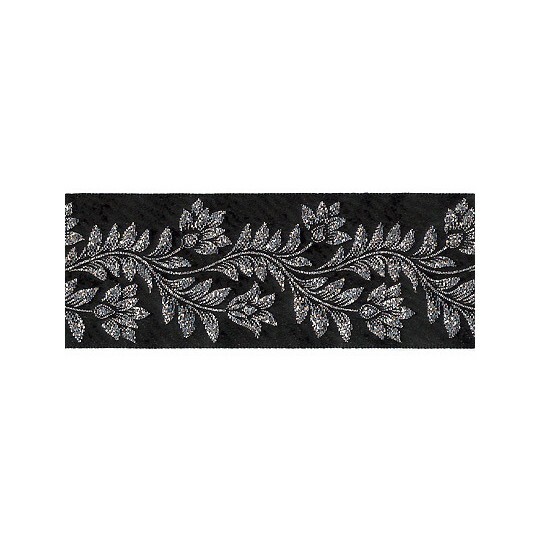 This fancy woven jacquard trim is lightweight and semi-sheer. It features a pretty stylized flower garland design in gold on a light blue background. 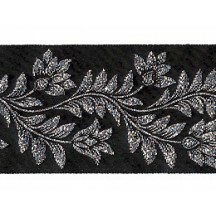 Measures 1-1/2" wide and is made in India, specifically for embellishing saris and traditional dress. Sold by the yard, please enter the number of yards desired below.